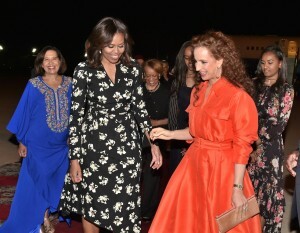 First Lady of the United States Michelle Obama arrives in Morocco, greeted by Princess Lalla Salma. Washington, DC, June 28, 2016 (MACP) — First Lady Michelle Obama is in Morocco today and Wednesday to promote her Let Girls Learn initiative. Launched in March 2015, the initiative brings together the Department of State, the US Agency for International Development (USAID), the Peace Corps, the Millennium Challenge Corporation (MCC), and other agencies and programs to help adolescent girls worldwide attain a quality education. “It just makes sense for boys and girls to be educated and involved and empowered,” said the First Lady during a panel discussion held in Marrakesh, where she was joined by actresses and fellow women’s education activists Meryl Streep and Freida Pinto. The visit—the first in North Africa for the Let Girls Learn initiative—brings new energy to several existing US-Morocco programs focused on girls’ education. Signed in November 2015, the second US-Morocco MCC compact includes the Education and Training Project, which prioritizes “delivering quality secondary education focused on the employability skills needed for the modern workforce,” and which will make a concerted effort “to ensure that the project results in equitable outcomes for both girls and boys and reduces social, gender, and regional inequalities.” Today, and in conjunction with the First Lady’s travels, the White House provided additional details on MCC’s $100 million investment in what it referred to as “a new model for secondary education in Morocco,” citing activities like “mentoring programs, internships, after-school clubs, upgrading bathrooms and changing rooms for girls,” and more. In its 2013-2017 Country Development Cooperation Strategy for Morocco, USAID pledged to work with Morocco’s Ministry of Education “to develop gender-sensitive reading materials” and “ensure gender equity in the delivery of training programs.” Today, USAID announced a “new $400,000 investment to establish five new girls’ dormitories… which will be ready by the next school year” and will allow girls living in rural areas to attend school. “I am so proud that the US is working with the Moroccan Government to make these transformative new investments to educate and empower girls across Morocco – investments that will help these girls succeed in the workforce and fulfill their boundless promise,” said Mrs. Obama in a statement. The First Lady is accompanied in Morocco by her mother, Marian Robinson, as well as her daughters, Sasha and Malia Obama. Prior to Marrakesh, Mrs. Obama was in Liberia; she will next be traveling to Spain, the third and final destination of her Let Girls Learn tour.